When customers are shopping in bulk – or buying large, unwieldy items – there is a surefire way to give your products an advantage on the store shelves. 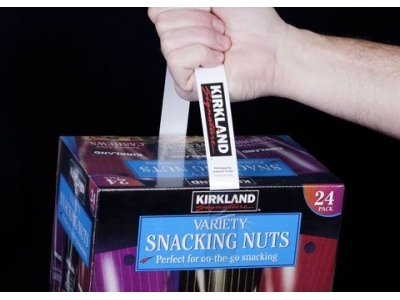 Do-It Carry Handles are full-color, branded additions to your product packaging that allow customers to easily grab, carry and transport your products from retail shelves. Integrated into your packaging, they offer your company additional marketing space and, most importantly, they create a lasting impression on customers that appreciate attention to detail and, above all else, the convenience of easy maneuverability. In this post, we’re going to look at why Do-It Carry Handles are a great way to complement the packaging of large or bulk products. Let’s be honest: grocery stores and shopping centers were invented for convenience. If you can increase convenience, you can increase sales. Do-It Carry Handles make it a snap to grab an otherwise difficult item off the shelf, plop it into a cart and head to the checkout lanes. Every inch of your packaging should be devoted to spreading your brand’s image and philosophy. Our Carry Handles are no exception! With the ability to print your brand’s imagery, logo and slogans directly onto the handle, your packaging will be a constant, persistent advocate for your brand. On retail shelves, you need to eke out every advantage that you can. You can be certain that if you offer a convenience that your competitors don’t, your products will gain favor with retail shoppers. At Do-It Corporation, we are the industry’s leading provider of point-of-sale display solutions. We didn’t get where we are by resting on our laurels. Constantly innovating and testing new products, our team is firmly committed to creating the most elegant, functional retail display solutions available. If you’ve been looking for a company that will work with you to optimize your use of your retail space, contact us today to discuss our Hang Tabs, Display Strips and Carry Handles!